In this section we would like to talk to you about the security in Peru, the what to do and NOT to do to have a total safe travel. It sounds really scary to read about this is in a travel agency website, isn’t it? But we think it is SO IMPORTANT that we can’t just avoid the topic. We have to speak about it and explain our visitors the risks, even when there are small risks, but you just have to be aware of them. Let us ask you a simple question, Would you travel to a certain place when you know that you are going to be stolen? We ask this question because the answer is so obvious! That’s Why We Want You To Be Aware of! And there is no better way to be aware than to be informed. Let’s stop the introduction and let’s get to the point. We will start explaining you each of the terms that were mentioned above. Terrorism The terrorism in Peru was really huge during the 80’s. And we mean it. A lot of violence, death, bombs, guns… it was horrible! Many people died and most of them were poor people who unfortunately lived in the areas where the terrorist were, mainly towns in the highlands and the forest. It was true, but luckily it belongs to the past… When Fujimori was elected a president during the 90’s, we eliminated most of it and our country started to be secure again, favoring tourism and also started an economical growth path as well, which is still middle way, unstoppable anytime soon. But, We bet you are asking yourself: What about now? During the last years, terrorism is very low in Peru. It is true that there are still a small presence of it, but it is very small and located on non-touristic areas in the internal jungle. It definitely does NOT represent a threat to you. It definitely does NOT represent a threat for any tourist. Robbery and pick pocketing Yes, there is, and unfortunately, in Lima there is a lot. We can’t deny this, because it is true. Peru is a developing country and it has a lot of poor people. Extreme	poverty is one the big issues of the country and a constant problem that the government has to face. Some of the people that can’t find a job and do not have any money to eat start stealing people, not only foreigners but nationals too. Please, do not get scared! It is true that there is a problem regarding crime as in major countries of the world, and it is also true that some tourist are indeed victims of this scam. But it is because NOBODY TOLD THEM what you are reading right now! Probably, their travel agent didn’t tell them the truth about the risks outside the hotel room in certain areas! Don’t you think? We Really believe so! We don’t want this to happen to you. Miraflores is, in general, a safe place. It is a tourist area and the city hall protects tourists a lot. When walking there just keep your eyes open and be careful if somebody talks to you or if somebody approaches to you too much. 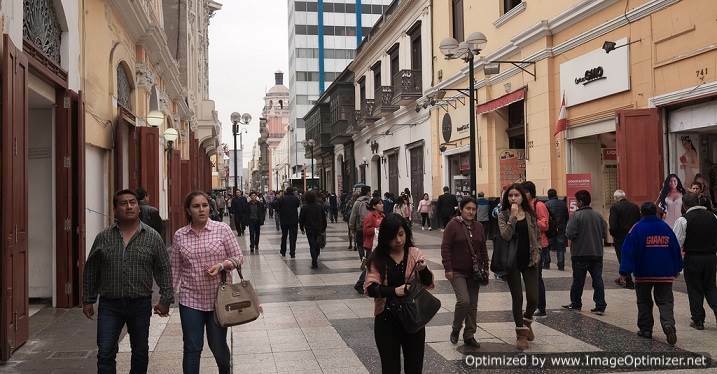 Lima downtown is a little more risky because it is the center of the city. When visiting it you will see some people that seems scary, avoid them. Do not show off your stuff (specially expensive watches, outfits, glasses and others); only take out your camera when you need to take a picture but not all the time. Do the same for mobiles, laptops, handheld devices, etc. Also, do not let people see your money, and, a very important one, do not wear expensive jewelry or an expensive watch because when you are in a crowded area, you might be surprised to find it gone. Avoid crowded areas, like when crossing the street ,because somebody can open your bag and steal your belongings. Barranco is pretty much like Miraflores, but since this district is the bohemian point at night, do not walk in desolated areas. Just be in the areas where there is people around. Other districts: San Isidro, San Borja, Surco, La Molina are safer. La Victoria, Rímac, Breña and Callao are more dangerous and not recommended unless you know the area where you are going. Otherwise, just avoid them because you can accidentally step into a street that is frequented by street thieves. The fact is, there are more suggestions, and the last thing we want to do is to leave them hanging, so our travel consultants will always be open to give advice when you can jump on and ask any question you like. And What About The Taxis? In case you are wondering, do I have to be careful with taxis too? The answer is YES, Be careful with taxis! And it is not that all taxi drivers in the city are part of the crime scene, not at all. The fact is, the law in Peru about Taxis is not good, anyone can put a sign on their car and become a taxi. It is as easy as that. Sadly, we have journalists, lawyers, engineers, technicians… and more… that are working as Taxi drivers. This is particularly bad because they are good people who studied a lot and didn’t find any opportunities to develop on their own career. These people are the Good Taxi drivers. But… not everybody is like this. There are bad and mean people out there too. The best is to book a taxi through the hotel reception. Usually the hotels have their own taxi or an agreement with a taxi driver or taxi-company. If this is not possible and you are on the street, try to find a registered taxi. They are yellow and have a sign on the top, plus a visible plate, with the number written in many parts of the car. Not able to find a registered taxi? There will be many cars with a taxi sticker in the window, or maybe no taxi-signs at all. Though they will let you know they are a taxi using their horn when they pass you. The best advice if you want to use an unregistered taxi is to look at the driver. Does the car have a plate? Does he look like an honest man, or a person who would drive you into a dark alley and rob you? Common sense in other words. If you are unsure and need to take the taxi anyways, please take note of the plate. You might need it later if something unpleasant happens. It is cheap to travel with taxis in Lima. And to bargain on the price is also possible. From the airport to city center, a price on 10-15 soles would be reasonable. However you can easily be charged 50 soles, if you look like you are not from there. ALWAYS agree on the price in advance. Tell your destination, get an offer, bargain if not satisfied with the offer and take the taxi if you can agree on the price. When you are inside. Lock the door and close the window. Don’t buy anything from the street sellers. Valuables are probably more safe in the trunk than inside the car in case you should be so unlucky to be robbed. After telling you all of this, we kind of think we went too far. We can bet you are really scared and thinking Peru is not good for you. But…People that come knowing all this have a better time and feel safer! It was not as you said! I took a taxi and the taxi driver was so nice, kind and talkative! We were very scared but when arriving we did not have to worry about that at all! I met so friendly people in Lima downtown and Miraflores! Once you are aware of things like we explained, you can come and have a more pleasant time, because, you would not notice this, but you will be protecting yourself and everybody will notice that! So, only the nice, friendly and honest people is going to talk to you! Isn’t It The Perfect Trip! So now that we’re on the same page, I would like to invite you to come to Peru and do not hesitate on it, this place is an amazing country that has coast, highlands and jungle, that has history and an alive culture full of feasts, rituals that honor the ancient gods of the mother nature, and that has so many friendly people. Things that you will definitely enjoy! Also, for more advice and details you can contact our travel consultants that have always first hand information and are willing to help you out all the time.